Rarely a day goes by without earthquakes shaking the Alaska Peninsula, a string of volcanoes curving off the Alaska mainland into the Pacific. Just off shore, two tectonic plates are converging: The Pacific plate is bending under the North American plate and pushing deep into the Earth. Along this subduction zone, scientists have noticed something unusual. Two adjacent sections that appear almost identical in large-scale characteristics—temperature, angle of subduction, age of the rocks—are exhibiting very different earthquake behaviors over short spans of just tens of kilometers. One section is highly active with small earthquakes; the other is more quiet but has large earthquakes every 50 to 75 years. 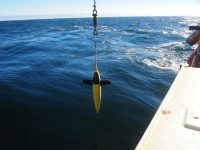 To get a closer look, Lamont-Doherty Earth Observatory’s research ship, the R/V Marcus G. Langseth, ran seismic surveys to map the ocean floor and the earth beneath it. The scientists found a key difference that is providing new clues to earthquake behavior: In certain locations, ancient faults that developed in the sea floor many millions of years ago are becoming active again as the oceanic plate bends, and they are dragging down massive amounts of water, contributing to earthquakes at unexpected depths, a behavior likely happening at other subduction zones, as well. “When we look at subduction zones around the world, we see changes in their earthquake behavior over short distances. Our paper is one of the first where we can see this direct correlation between abrupt changes in the faulting and water in the plate and then in the earthquakes in the subduction zone. 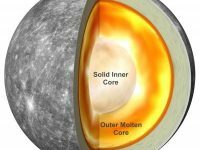 It’s one explanation for why things can change so dramatically along subduction zones,” said lead author Donna Shillington, a seismologist at Columbia University’s Lamont-Doherty Earth Observatory. Shillington and her co-authors describe their findings in a paper published online today in the journal Nature Geoscience. Whether an ancient fault is likely to move again as the plate bends depends on its angle to the subduction zone, the study found. Picture a sheet of thick cardboard that has been scored with parallel lines. If that cardboard is bent parallel to the cut marks, the cuts open up as the cardboard bends. Bend it cross-wise, and the cut marks don’t move much if at all. Along the highly active Shumagin Gap, near the town of Sand Point, the ancient faults run nearly parallel to the subduction zone, and the sea floor is rougher. At the quieter Semidi segment, just to the northeast, they come in at about a 70 degree angle instead. 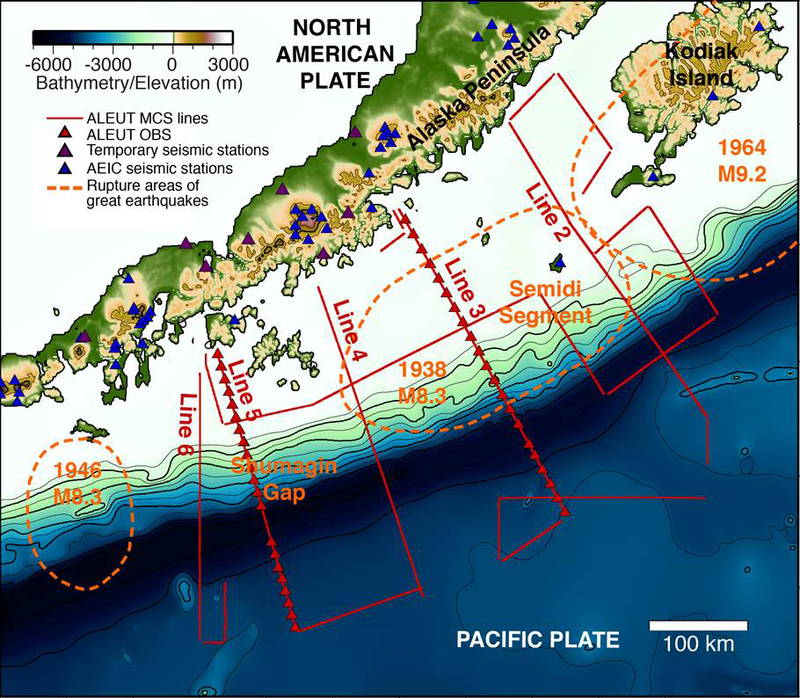 Two things are happening at the Shumagin Gap to trigger so many earthquakes: First, the scientists believe that the rough top of the diving plate, resulting from faults moving as the plate bends, creates small earthquakes as it slides against the continental plate. Second, the water dragged down by the faults contributes to earthquakes and volcanic activity deeper inside the earth. The water is captured in crystals within rocks like bright green serpentinite. As the rocks push deeper into the earth and heat up, the water is released from those pores, and the rocks become brittle, setting the stage for deeper earthquakes that have been happening at pressures and temperatures that are considered abnormal for earthquakes. At the quieter Semidi segment, in contrast, the ancient faults in the sea floor don’t shift as the plate bends against the grain. The surface is smoother as the ocean plate dives under, and less water is carried down. This section of sea floor off the Alaska Peninsula got its start those millions of years ago at mid-ocean ridges, where oceanic plates are pulling apart. 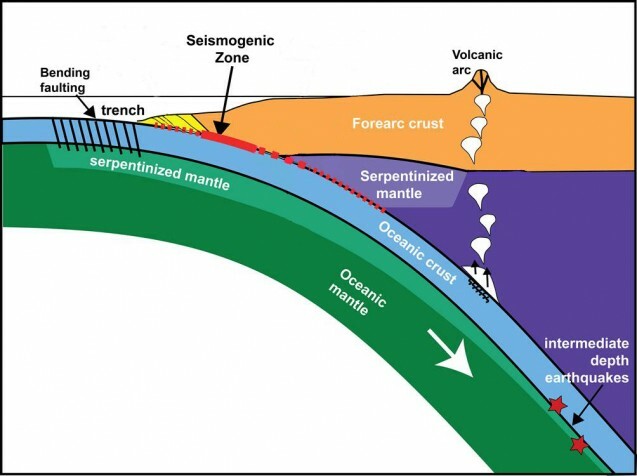 As the plates pull apart, magma flows up, creating new sea floor. And as that new sea floor cools and pulls apart, the stress creates faults that form the texture, or bathymetry, of the ocean floor. In this case, the sea floor at the Shumagin and Semidi segments formed at different ridges that were spreading at different rates, leaving more faults in the Shumagin segment and at angles that today happen to be close to parallel with the subduction zone. 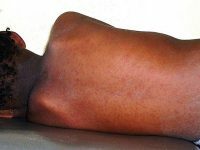 The scientists found similar situations in data from a Langseth cruise off Costa Rica in 2008. Looking back at the data, they can see the differences in the way the plate faulted and the amount of water pulled down, Shillington said. The co-authors of the paper are Anne Bécel, Spahr Webb and Jiyao Li of Lamont-Doherty Earth Observatory; Mladen Nedimovic and Harold Kuehn of Dalhousie University; Geoffrey Abers and Katie Keranen of Cornell University; Matthias Delescluse of Laboratoire de géologie de l’ENS–PSL Research University; and Gabriel Mattei-Salicrup of the University of Oklahoma. Learn more about seismic imaging and the work underway at Lamont-Doherty Earth Observatory. To map the subduction zone, scientists run multi-channel seismic streamers to capture 3D images of the earth below.